My best Craigslist find is the salmon pink couch in the photo above, which I bought for $75 (not a typo), sight unseen from an estate sale in Martinez, CA. I had to look up Martinez on Google Maps and take a leap of faith, but It's now my favorite piece of furniture in the house. I understand why people are dissuaded by Craigslist because of the possibility of bed bugs, impossible moving logistics, and axe murderers. 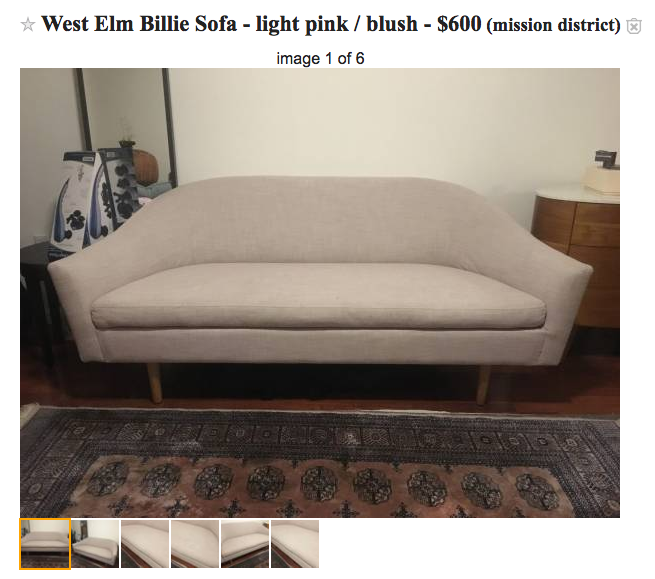 But if you keep some straightforward tips in mind, you too might find the $75 pink sofa of your dreams. There are only two types of things I buy on Craigslist: lightly-used furniture from popular retailers (West Elm, Ikea, Restoration Hardware, etc.) or quality vintage furniture that will stand the test of time. But usually, I tend to look for vintage furniture on Craigslist. To me, vintage has more character than the latest picks from West Elm or Ikea, and will make your house more interesting by extension. And furniture was often better-made 40 or 50 years ago than it is today. My pink sofa was made in the 1950's. It has a hardwood frame, down-filled removable cushions, and was manufactured in the United States. This combination of features is a rarity now, even for expensive sofas. My sofa will last a lifetime, which is more than I can say for a new sofa from Ikea. Different terms for the same item: For instance, sofa v. couch, bureau v. dresser, nightstand v. side table, shelves v. bookshelf -- all will yield different results. Variations of spellings: Crate and Barrel v. Crate and Barrell, or Anthropologie v. Anthropology. Popular modifiers: I typically add words to narrow down my search like "vintage sofa," "mid-century sofa," and "linen sofa." Craigslist is never-ending, and you have to start somewhere, especially for common household items. Get specific: Terms like "rattan" or "Eames" will get you much closer to where you're looking than "chair." Once I have my search narrowed down and get tired of scrolling, I grab the resulting Craigslist URL and set an email alert using IFTTT ( it means "If This, Then That.") The service has truly unending possibilities, but this recipe lets you set up an email alert every time a new listing matches your Craigslist search criteria. I found three San Francisco apartments this way, and it works great. I would suggest setting an alert only for very specific terms, like "West Elm Tillary Sofa," not just "sofa," so you don't get inundated with emails. I read this tip on Jordan Ferney's blog a few years ago, and it has really stuck with me. Essentially, she writes that if you're a decisive buyer you're more likely to get what you want. Why? Imagine you're the person selling something. You just want the thing out of your house, cash in hand, not someone asking you for dimensions and waffling about what time to show up. You want to sell it to the person who seems the most reliable and not-spammy. Once you have the person's phone number and have a concrete time to come by, then you can ask follow-up questions or politely request a lower price (see below.) But keep it simple from the beginning and they're very likely to pick you. Not only did I get the item, I persuaded the buyer to pick me over several others who had emailed before me because i was decisive and serious about purchasing the dresser. It works every time. I rarely try to negotiate a lower price with Craigslist sellers, usually because it violates my decisive rule above and isn't worth the time. If the item is in good condition, accurately described in the listing, and clearly selling for less than it's worth, I think it's not worth trying to get it for $10 less. Just appreciate your deal and move on. But if it looks like the listing has been up for a while or I know the item isn't worth what the person is asking, I will sometimes politely ask if they'll accept a lower price. On occasion, they're so eager to get rid of it, they'll say yes. Uber and Lyft: Both services offer an "XL" option where you can request a larger car, and this is usually how I get furniture home. I always call the driver as soon as my ride is accepted to make sure they don't mind, and I never assume they'll help me move my purchase (although they always do). I thank them profusely, tip generously, and have never had any problems. Lugg: This is a more furniture-moving-friendly version of an Uber XL, usually two guys and a truck who can pick up furniture and move it on demand. The challenge is that your item needs to be paid for in advance so Lugg can pick it up. You either need to go see the item in advance and pay the seller then, or PayPal the person from afar and hope you like what you just bought sight unseen. A responsible person would do the former, but I have done the latter many times without issues. I bought my pink couch sight unseen, paid the seller via PayPayl, and sent Lugg to go pick up my couch. 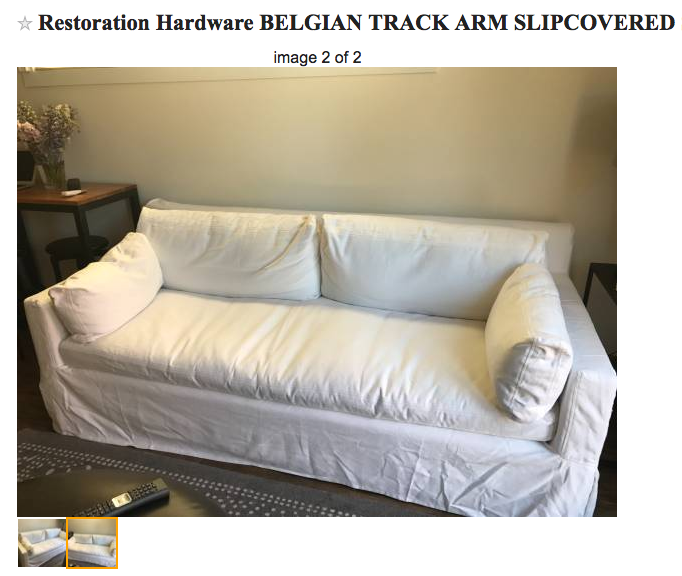 They charged me $150 for delivery, which was more than the total cost of the couch, but I was confident I could re-sell it for more than I paid in total. And I seriously lucked out when it arrived. Pay the seller: Unless the Craigslist listing says "YOU MUST PICK UP" in all caps and with multiple exclamation points (in which case they probably mean it), I usually start by offering the person $25 to $50 on top of the price they're asking if they'd be willing to deliver the item. Usually people say no, since they just want the thing gone or don't own a car themselves, but this strategy has worked perfectly a number of times. If the item isn't bulky and the person lives nearby with a car, they're usually happy for the extra cash and I'm happy for door-side delivery -- this is how I got the circa-1960's Eames knock-off below. This is the obvious but important reminder to be safe when showing up at people's houses with cash. I try to arrange meetings during the day, tell the person "my friend and I will be there at 5 PM," even if I'm going alone, and always tell an actual friend the address I'm headed to and what time I'll text them after. I've never encountered a sketchy Craigslist seller, but you never know. And when selling on Craigslist, I usually move the item into my garage beforehand so I'm not inviting strangers into my house. I also ask sellers (after my decisive email) to confirm that the item they're selling doesn't have any bugs, smells, or defects. I operate under the assumption that no one is unkind enough to sell furniture from a bed bug-infested house. Saying this probably jinxes it, and if you got bed bugs from a Craigslist purchase, please don't tell me about it. ... but just in case, before bringing anything new into the house, I inspect it thoroughly for bugs, smells, or stains. (The telltale sign of bed bugs is tiny black dots or specks in the corners of furniture or on upholstery. If you see that, run). I use the small brush attachment on my vacuum to get in every crevice and corner, because who wants someone else's crumbs in your sofa. If the item can be bleached, I do that. With rugs or my sofa, I had them professionally cleaned. This usually costs about $100 but is completely worth it for the peace of mind and fresher smell. I love my pink sofa more than any other piece of furniture in my house, and I know it's partly because it was such a great score. If you found something awesome on Craigslist, please let me know in the comments!